Arsenal's Premier League title hopes suffered a huge blow with a shock home defeat as Watford secured their first top-flight win over the Gunners since 1988. Former Tottenham defender Younes Kaboul lashed in the opener within 10 minutes for Watford with a shot from outside the area which deflected off Aaron Ramsey. Just two minutes and 57 seconds later, the visitors doubled their lead as Troy Deeney tapped in the rebound after Etienne Capoue's fine run ended with his shot being saved by Petr Cech. The Arsenal goalkeeper was called into action again as he tipped Sebastian Prodl's header over the crossbar and pushed away Daryl Janmaat's curling strike. 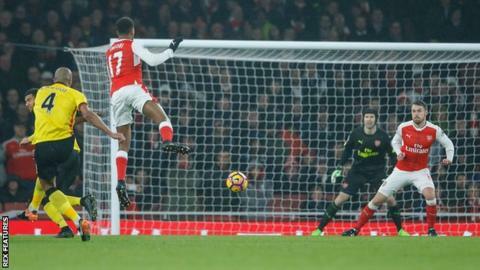 The hosts improved significantly in the second half and Alex Iwobi pulled a goal back by steering Alexis Sanchez's cross home. Lucas Perez struck the crossbar with a powerful drive, but they could not find the equaliser. Challenge over for another year? Arsenal last won the title in the 2003-04 season and face clawing back a nine-point deficit on London rivals and leaders Chelsea, who drew 1-1 with Liverpool. And their task is made more difficult as they still face trips to play Antonio Conte's side as well as Liverpool and Tottenham - the other three teams in the top four - between now and the end of the season. Going into this game they were unbeaten in their last five league fixtures, but a desperately poor first half showing - with manager Arsene Wenger watching powerless from the stands as he served the second of a four-match touchline ban - cost them dearly. The Gunners failed to get a shot on target in the first 45 minutes, but forced Watford goalkeeper Heurelho Gomes into sharp saves from substitute Theo Walcott and Iwobi after the break, while the Brazilian pushed away Mesut Ozil's snap shot. But they suffered their first defeat at the Emirates Stadium since the opening day against Liverpool, ending a run of eight victories and two draws. Watford boss Walter Mazzarri was under increasing pressure after an embarrassing FA Cup exit at Millwall and seven games without a win in the league. But the visitors' energetic start - pressing Arsenal high up the pitch and not allowing the hosts time on the ball - created the platform for them to climb to 13th in the table, eight points clear of the relegation zone. Central midfielder Capoue produced a dynamic performance. He contributed seven tackles and won the ball back the same number of times to top his team's defensive statistics and lay the groundwork for Watford's first league win over Arsenal in nearly 30 years. Debutant M'Baye Niang, signed on loan from AC Milan until the end of the season, showcased his pace in the 70 minutes he was on the pitch and his strong running down the left caused Arsenal right-back Gabriel constant problems. Arsenal manager Arsene Wenger: "It was obvious we lost duels and were not sharp enough. It looked more mentally that we were not ready for the challenges. We were unlucky for the first goal which was deflected after a soft free-kick. "It took us a while to get into the game; it was all us in the second half and we were unlucky not to get something from the game." Watford boss Walter Mazzarri: "We played a great first half and the condition of some of the players is returning. In the second half, Arsenal managed to press us but in general it was very well done. "Against a great team in their stadium, you cannot allow them to play too much of the ball and you have to press them. We did that very well but you cannot do it for 90 minutes. That was our tactic." "I have to give Watford credit because they had not won in seven games but did not look like a side lacking confidence. They had a good game plan and looked a threat on the break. "I was a bit surprised by Arsenal. You can't start games like they did today. It was lethargic, sloppy and they did not look like a team going for the title. For the first 25 minutes they were lucky to be only 2-0 down. Watford were the first to every ball. "Capoue was a driving force throughout the game. He had a great start to the season and faded but he was back to his best today. His performance was superb. "Arsenal played better in the second half but you can't keep giving yourself a mountain to climb against such quality and expect to win games. You are never going to win the league that way. Defensively, even though they brought in reinforcements, I still don't think they are anywhere near Chelsea." Arsenal face a crucial trip to Chelsea at Stamford Bridge on Saturday (kick-off 12:30 GMT), while Watford host Burnley the same day at 15:00 GMT. Watford earned their first league win against Arsenal since April 1988, ending a run of seven straight defeats against them. Younes Kaboul has scored more Premier League goals against Arsenal than he has against any other side (3). The Gunners had not conceded a goal in the opening 15 minutes of their last 53 home Premier League games before tonight. Alexis Sanchez has had a hand in six Premier League goals against Watford (three goals, three assists). He has not been involved in more against any other club. The Hornets ended a run of seven Premier League games without victory (drawn three, lost four), since beating Everton in December. It was their first away league win since October, when they beat Middlesbrough 1-0. Despite having twice as many shots in total as Watford (20-10), Arsenal had one shot on target fewer than the Hornets (5-6). Match ends, Arsenal 1, Watford 2. Second Half ends, Arsenal 1, Watford 2. Corner, Watford. Conceded by Gabriel. Attempt saved. Lucas Pérez (Arsenal) left footed shot from the left side of the box is saved in the bottom left corner. Assisted by Mesut Özil. Corner, Arsenal. Conceded by Sebastian Prödl. Corner, Arsenal. Conceded by Younes Kaboul. Stefano Okaka (Watford) is shown the yellow card for a bad foul. Lucas Pérez (Arsenal) hits the bar with a left footed shot from the right side of the box. Assisted by Gabriel. Substitution, Watford. Stefano Okaka replaces Troy Deeney. Attempt missed. Nacho Monreal (Arsenal) left footed shot from outside the box is close, but misses to the left following a corner. Corner, Arsenal. Conceded by Troy Deeney. Gabriel (Arsenal) wins a free kick in the attacking half. Attempt missed. Craig Cathcart (Watford) header from the centre of the box misses to the right. Assisted by Etienne Capoue with a cross following a corner. Attempt missed. Gabriel (Arsenal) right footed shot from outside the box is high and wide to the right. Assisted by Lucas Pérez. Delay in match Tom Cleverley (Watford) because of an injury. Attempt blocked. Alex Oxlade-Chamberlain (Arsenal) right footed shot from the left side of the box is blocked. Assisted by Mesut Özil.